Mitch Harris is a friend of the O’Hallorans, and he’s responsible for law and order in Hard Luck. He’s also the widowed father of a little girl, although he never talks about his marriage. But it’s not long before seven-year-old Chrissie decides that her new teacher, Bethany Ross, is the perfect candidate for wife and mom! 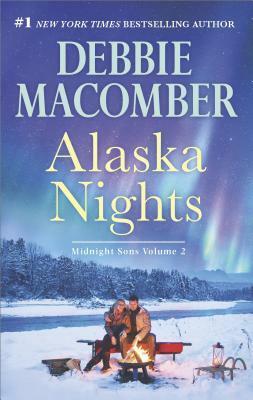 Alaska Nights by Debbie Macomber is a sweet heartfelt book. Containing two novellas inside, I was intrigued. Both stories were about second chances, new beginnings, and love. Love pops up even when the characters least expect it to…the, there’s secrets that are waiting to burst. A father never knowing he had a child and a woman who has yet to tell her ex about the baby they just created together. Funny, realistic, and steady. These characters bring a lot of drama, humor, and friendship wherever they go. Daddy’s Little Helper was the cutest of the two novellas. A little girl goes about setting up her father and new teacher. Imagine an eight-year-old asking such serious questions about age, love, and marriage. Chrissie Harris wants a brother or a sister. But she cant have either one unless her dad marries. And she won’t stop trying to setup her dad with her brand new teacher, Bethany Ross. Bethany Ross just moved out to Alaska. Her goal was to find out what her birth dad was like. It so happens her birth father is like her in many ways. Mitch Harris lost his wife when their daughter, Chrissie, was just a baby. He and his wife didn’t get along…marriage isn’t something he wants until, he meets Bethany Ross. Overall, I enjoyed reading Alaska Nights. A book containing two stories in the Alaska series. Men needing women in their lives. Women who can’t resist the Alaskan men makes for an interesting journey. Debbie Macomber has proved that she can definitely write well. Her two fictional worlds felt so real. I recommend this collection to all.